Can we use satellites instead of ground stations to measure temperature and estimate climate response functions? Temperature data are commonly used to estimate the sensitivity of societally relevant outcomes to ongoing climate changes. In order to derive a temperature measure, researchers typically interpolate nearby ground station data or use one of the publicly available global gridded data products put out by groups like CRU or UDel. However, Max and Sol and Wolfram and Adam have shown that there are a number of pitfalls associated with using interpolated station data to measure temperature in areas with sparse coverage. Temperature estimates far from weather stations, or in areas where stations go on and offline frequently, are subject to substantial measurement error that can bias impact estimates. This problem is particularly acute in tropical regions, where many of the largest climate impacts are expected to occur, but where we still have a limited understanding of key climate/society relationships. David, Marshall and I have a new paper that evaluates whether using temperature measures derived only from satellites can be used to estimate climate response functions. Several satellites measure surface emission of thermal energy, which can be converted into estimates of skin surface temperature (Ts) – a product that MODIS has provided at 1km resolution daily for nearly a decade. Past studies have evaluated agreement between MODIS and air temperature measured by weather stations (Ta) on daily time scales, often finding weak correlations for daytime temperatures because factors other than Ta, such as cloudiness and soil moisture, can affect Ts. However, these results could be of limited relevance for our purpose, since the climate response functions we care about usually rely on year-to-year variations in seasonally aggregated measures of temperature exposure, and correlations between station and satellite data tend to increase as the period of aggregation lengthens. In order to test whether Ts could be used in place of Ta to study temperature impacts, we revisited three previous studies (each led by a different G-Feed blog contributor) that had used standard measures of Ta to study climate impacts. For each study we replicated the analysis with both Ta and Ts and compared model performance. The first study examined temperature effects on maize yields in Africa using historical field trial data from plots under optimal management and plots under drought management. The second study looked at county level maize yields in the U.S. and the third study, which we selected to look at an application outside of agriculture, estimated temperature effects on county-level GDP in the U.S.. In order to assess model performance we calculated out-of-sample prediction error by repeatedly estimating the models on randomly selected 75% subsets of locations, predicting values for the 25% of locations that had been excluded from estimation, and calculating the RMSE of out-of-sample predicted values relative to actual values. In each case we found similar relationships between temperature and the outcome of interest (panels 1 and 2 below). 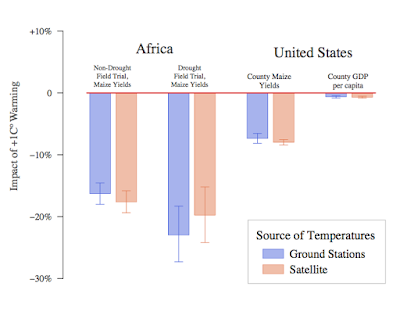 For both types of African maize field trials we actually found that models with satellite temperature had lower prediction error than models with ground station temperature. However, when we compared models in the U.S. (panel 3) with its high density of stations, the models had very similar predictive powers. This finding suggests that Ts is more useful in regions with poor station coverage where Ta is measured with significant levels of error. Response functions for maize yields in Africa (left 2 plots) and maize yields in US (right plots). Orange is surface temperature from MODIS, blue is air temperature from stations. While Ts predicts crop yields well, it is less clear whether it could be used to estimate response functions for non-agricultural applications like GDP. The GDP study also differs from the agricultural studies because instead of using seasonal averages for temperature we used temperature bins. The satellite data we used were 8-day composites so for every observation that fell into a given temperature bin we assigned eight days to that bin (in other words we assumed constant – or at least within a constant bin - temperature for each 8-day period). Even with this assumption, the model with Ts (somewhat surprisingly to us) reproduced a similar non-linear response function over most of the temperature support, particularly at the upper end of the temperature distribution where income appears to be most sensitive to temperature. Replication of Deryugina and Hsiang (2014), using ground stations (left) and MODIS (right). Lastly, as a final comparison, we compared the aggregated impacts from 1◦C warming estimated with both models. In doing so we again find similar estimates for all applications. Impact of +1C warming for different models. 1. Some of the “noise” in Ts vs. Ta relationships stems from errors in the Ta measures, particularly in regions such as Africa where Ta is often interpolated from anomalies at stations tens of kilometers away. 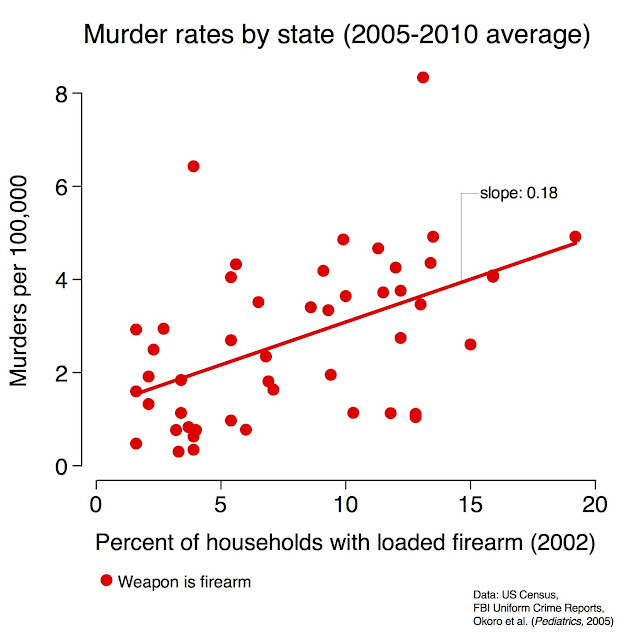 So just because Ts and Ta don’t always agree it doesn’t necessarily mean Ts is wrong. 2. Much of the noise likely cancels out when aggregating temperatures to the monthly or seasonal time scales that are used in regressions that relate outcomes to temperature. For applications that require finer temporal resolution of temperature measures, the noise in Ts may become more important – although again, whether it is larger than noise in high-temporal-resolution Ta remains an empirical question. 3. Unlike ground measurements, satellite data come from a consistent sensor. Relative spatial variations could therefore be captured more precisely with satellites than with ground measurements from different instruments. 4. There is reason to believe that Ts could be more appropriate than Ta for agricultural applications. In vegetated areas much of the noise in the daytime Ts vs. Ta relationship arises from anomalous canopy transpiration rates, with stressed canopies often several degrees warmer than Ta whereas healthy canopies are typically several degrees below Ta. Thus, Ts provides a more direct measure of crop condition than Ta, and this represents an advantage of Ts for agricultural applications that may compensate for some of its deficiencies. Overall this exercise increased our optimism that Ts can serve as a replacement for Ta in some applications. One of the primary downsides of using satellite data is that the records do not go back as far as ground station records so this approach will not be appropriate for many studies with longer timescales. There are also some issues surrounding the transformation of Ts units into Ta units that we discuss in the paper. Despite these caveats, for studies covering recent years our results suggest that Ts is a viable option for replacing Ta, and that in areas with poor ground station coverage, using satellites to measure temperature may in fact be the better option.